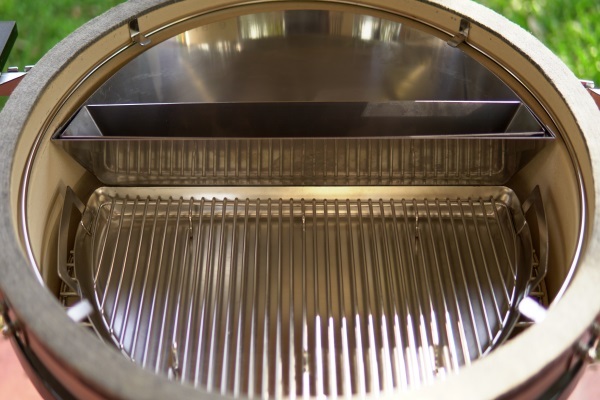 The world’s first kamado with true two-zone cooking ability! Thought you knew all that a kamado could do? Think again! 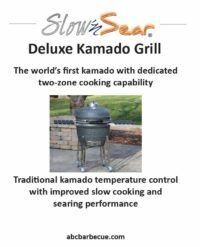 The Slow ‘N Sear Deluxe Kamado has been designed around existing 22″ ABC products to give you the most versatile, easiest to use kamado on the market. 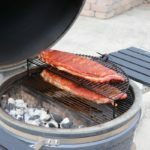 Stay in the loop on all things Slow ‘N Sear Deluxe Kamado – new videos, product reviews, and more! Two zones are better than one. Today’s kamado-style grills, based on a centuries-old design, are well known for their thick, insulated walls and excellent heat retention. 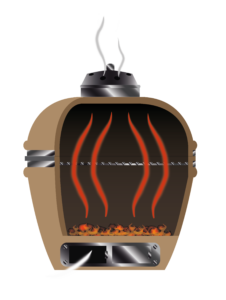 Typically, coals are placed in the lower portion of the cooker and food is placed on an upper cooking grate creating a one-zone cooking environment (shown, upper right). 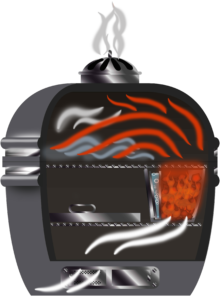 Temperature is uniform throughout the grill’s cooking surface whether cooking low ‘n slow or at temperatures 700°+ F for searing. The Slow ‘N Sear Deluxe Kamado has all of the sought-after characteristics of a high quality kamado cooker and then delivers MORE. Utilizing the patented Slow ‘N Sear® inside the cooking chamber, this kamado improves one-zone cooking and enables a true two-zone cooking environment (shown, lower right) creating the most versatile kamado on the market. The elevated placement of coals using the Slow ‘N Sear also allows for direct searing over high heat flame. 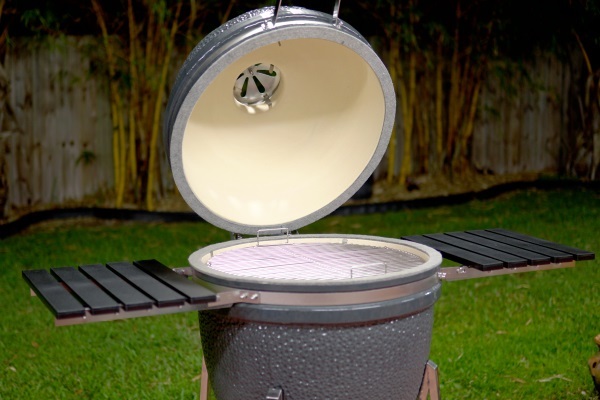 The basket holds coals and concentrates heat for the ultimate kamado searing experience. With two cooking zones available at all times it’s incredibly easy to use front- or reverse-searing techniques, too! No lengthy waits to heat up (or cool down) your grill. High heat cooking requires a durable cooking grate; our stainless steel Two-Zone Cooking grate is included in the package! Cordierite (50%) for maximum thermal retention and durability. 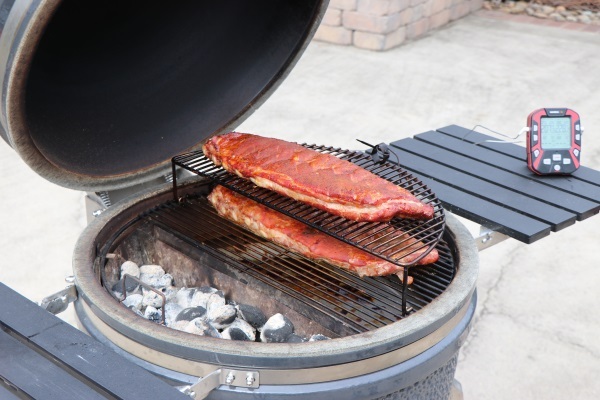 We kiln our bowl hotter and longer than other grills to make sure cracking is never an issue. 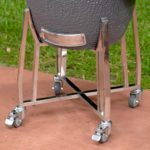 Reinforced bowl support for maximum stability; rolling casters on all four legs lets you position the grill wherever you need it, front locking casters keeps it there. Sturdy stainless steel construction; easy and consistent up/down motion. 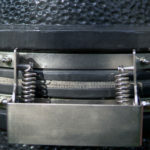 A thick, high-temperature, flexible felt gasket fitted around the top lid and bottom bowl forms a tight seal, even when thermometer probe wires are run under the lid. 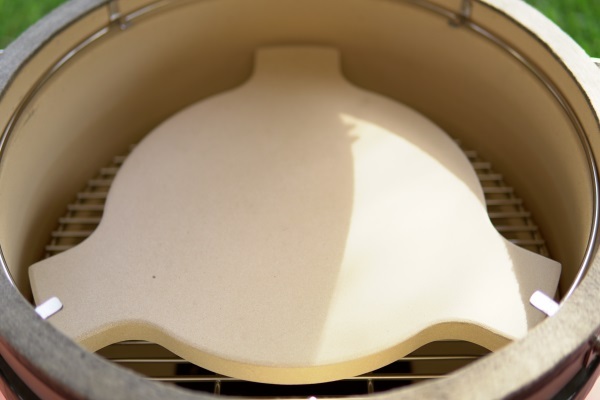 Use the kamado in a more traditional mode with the included ceramic diffuser plate. Collapsible, weather-resistant shelving provides 460 sq. in. of convenient table space. Stainless steel hinges and brackets. Add 180 sq.in. of cooking space with the stainless steel Elevated Cooking Grate. Get more room for low ‘n slow cooks, or diversify your grilling styles by placing the rack over the coals for “Santa Maria”-style cooking. 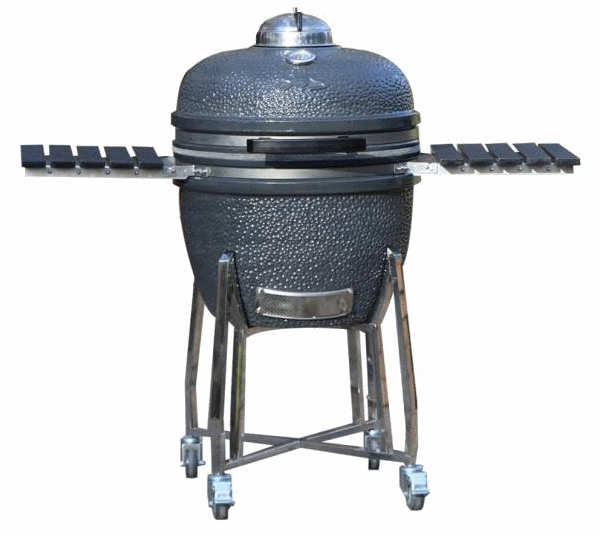 Download the product brochure for a convenient way to view all the product details off-line or to share news about this incredible grill with family and friends. Or use these buttons to share this page instantly! Our mission is to bring products to market that fulfill an unmet need. 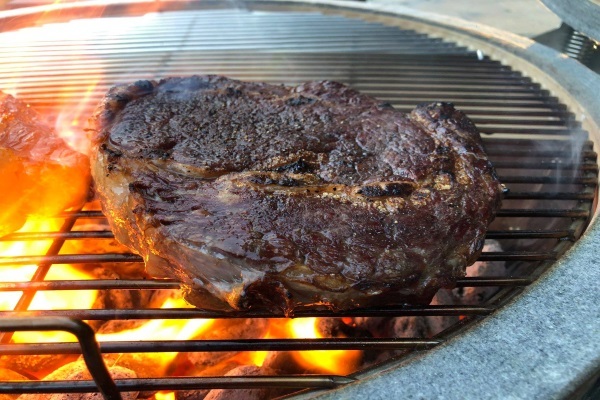 The #1 request for a Slow ‘N Sear in a different grill type is for kamado cookers. 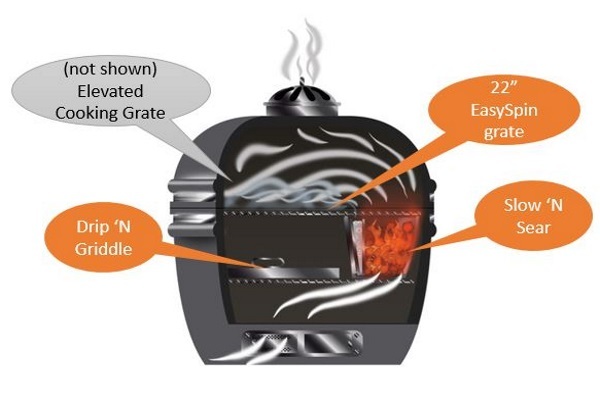 That request, and our own experience, shows that there is a desire among kamado users for true two-zone cooking. With the Slow ‘N Sear we deliver proven, effective, reliable two-zone cooking. It excels at low ‘n slow and high-heat searing and it easy to switch between them, something that existing kamados can’t do. The other issue with kamado cookers is their inability to deliver true smoke flavor. 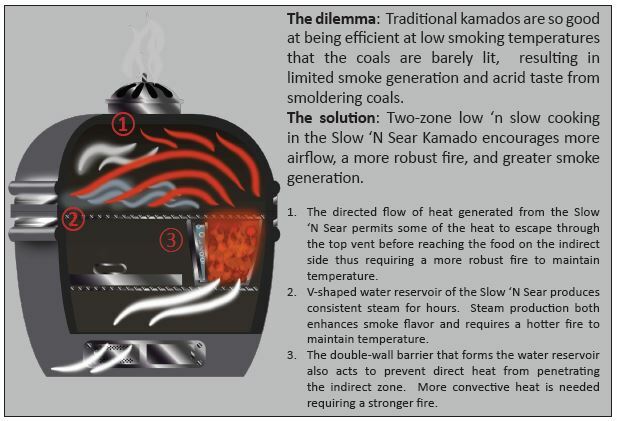 Due to the efficiency of kamados, it’s difficult to dial in low ‘n slow temperatures (225° F) without smoldering the coals. The end result is often bitter smoke and little smoke ring. With TurboSlow™ technology, we’ve developed a way to increase airflow (and amplify smoke flavor) without overshooting low ‘n slow cooking temperatures. What type of charcoal is recommended? Do I have to use lump? 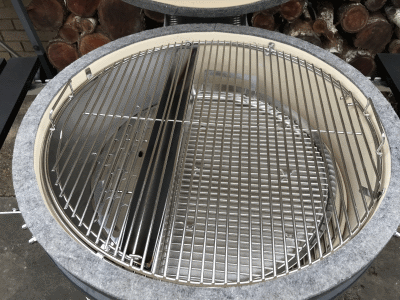 We designed the Slow ‘N Sear Deluxe Kamado to accommodate both lump charcoal and briquettes, feel free to use whatever you’re most comfortable with. COMING SOON! We’re launching our own brand of premium lump briquettes – all the long burning, low ash characteristics of lump charcoal with the ease and consistency of a briquette! 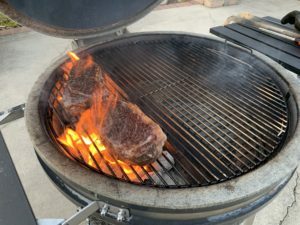 Can I use the kamado in a “standard” low ‘n slow cooking configuration with charcoal on a lower grate and a diffuser plate? Yes! 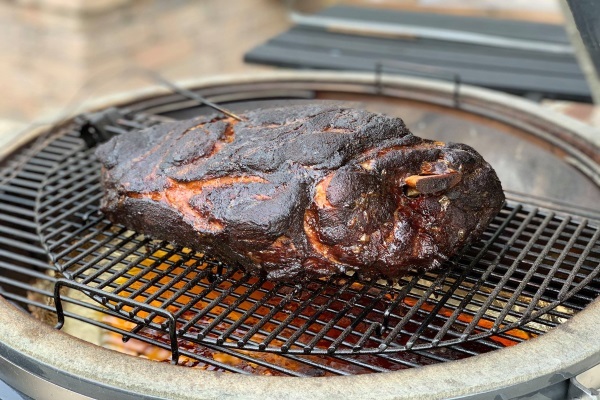 The kamado comes standard with a lower cast iron charcoal grate and a ceramic diffuser plate should you wish to use the entire upper cooking grate to hold food. That said, with the included Elevated Cooking grate and the Slow ‘N Sear installed, you’re not losing any cooking space AND you get the added benefit of easy access to the coals if you need to refill or want to quickly switch to high-heat searing. I’ve heard ceramic grills can crack under high heat. 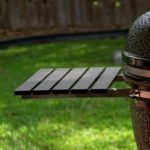 Is this a concern with this grill? Not at all. We use cordierite ceramic in our grill which has a very high thermal resistance. We want you to enjoy all the high heat grilling and searing that the slow ‘N Sear offers without concern for the durability of your grill. Enjoy! Is there a port for thermometer probes? Our high quality, thick felt gasket safely and securely accommodates thermometer probe wires without damage to the probes or air leaks into the grill. No latch required! Can I use a thermostatic controller with this grill? Yes! 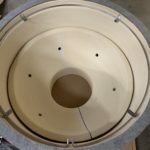 The bottom intake vent is a standard size that will accommodate many different types of controllers already on the market. 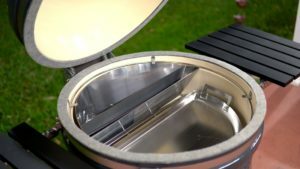 Will the kamado be available internationally? I’ll start out that I am new to owning a kamado. Now that that’s out of the way, I have researched them heavily. I ended up not being satisfied with what I would get for the cost, and purchased a kettle with a slow n sear. And a Weber Smokey mountain. Results had been fantastic as expected. 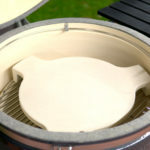 However when ABC released the infoon their version of a kamado, my interest peaked again. Having debated between the standard 18”, or high dollar 24” in the past, this one came in at 22”. Comparably priced as well. Perfect. That along with the few hundred in accessories that work in a standard kettle, this is a no brained! The quality is top notch, has an outstanding warranty, cooks as it should ( slight learning curve) and above all, you will have the best customer service you can find. Thank you Adrenaline BBQ company!